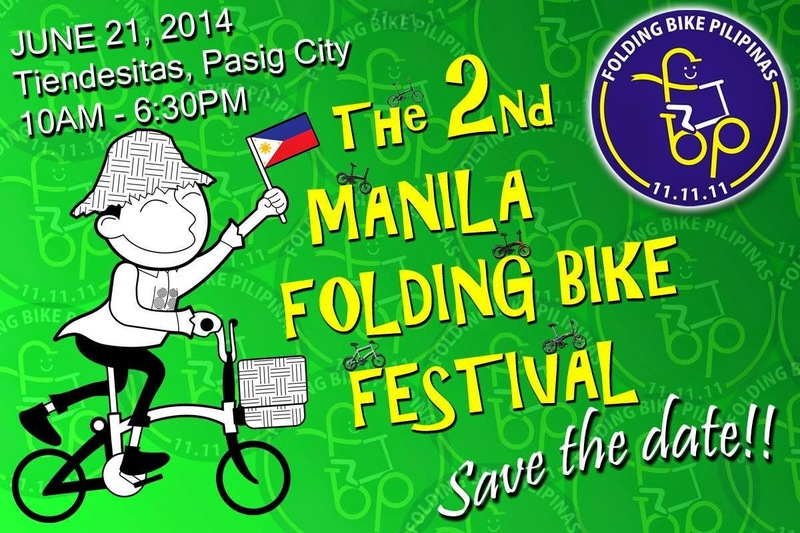 THE “2ND MANILA FOLDING BIKE FESTIVAL” UNFOLDS AT TIENDESITAS—SATURDAY, JUNE 21, 2014! Folding Bike Pilipinas (FBP), established on November 11, 2011, is a convergence of different bikers from a diverse number of biking groups. All members came together as they share a common passion about using folding bikes a sport, as a form of transportation and as a part of their lifestyle. FBP likewise supports significant advocacies—all in the spirit of fun and solidarity. In 2012, FBP saw it was about time it shared this sense of passion with everyone, thus, in the spirit of camaraderie, it launched “THE 1st MANILA FOLDING BIKE FESTIVAL”—a whole day affair that included a folding bike parade, bike show, talks about biking and its benefits, raffle, bike bazaar, bike clinic, exhibit and competition plus a lot more that made it truly a celebration of the comradeship that connected everyone, the way biking always do. The said breakthrough event was attended by almost a thousand bikers from all walks of life. Thus, following the overwhelming success of that event, it is with great pride and joy that FBP is re-launching a sequel in continuation of its desire to spread the love of folding bikes with the “2nd MANILA FOLDING BIKE FESTIVAL”. Onsite registration fee is P300.00 per bike/entry. Participants will be allowed only up to five (5) bikes/entries. No less than Firefly Brigade Philippines’ president, Karen Crisostomo, will grace the event with her presence and give a short talk about the group’s advocacy. There will also be an area where bike part and accessories will be sold. A “bike clinic” spearheaded by FBP member Atty Lucio Binalla will also take place. Other activities and interesting segments include booth games, a roving photoman from iFlick, and freebies for those who come early. After the announcement and awarding of the Bike Competition winners in the afternoon, the event will end with a high note as FBP, together with its valued sponsors, will raffle off gift certificates, bike-related items, Cycling apparel, bike frames, a mountain bike and and three (3) folding bikes. The “2nd Manila Folding Bike Festival” is powered by Folding Bike Pilipinas in cooperation with Firefly Brigade Philippines, Brompton Club of the Philippines, Polkit, United Folding Bikers and the Cainta Mountain Bikers. The event is done with the valuable support of Mars Kingdom, Brompton Philippines, Dahon Philippines, Fucoidan Wellness and Rejuvenation Center, Kojie San, R.O.X., Coolstuff, Peerless (Litepro), Ed Lee Designs, Crius, Barako Bull and Holly’s Milk. For other details and announcements, you may visit their FB Page here.